Oasis hotel at Gold Spike, 217 Las Vegas Boulevard North, is located Downtown, ideal for party goers, right in the heart of the Fremont Street area. Oasis Boutique hotel at Gold Spike is located Downtown, right in the heart of the Fremont Street area, making it ideal for party goers, who want to experience all the wonders that the entertainment capital of the world has to offer. If access to Fremont Street wasn’t enough, it also provides easy access to places like the world-famous, Las Vegas Strip, (about 2 miles) and much, much more. This makes it ideal for anyone who wants to have a good time in Vegas, which is slightly less expensive than the places at the heart of the Strip. The hotel provides access to a good range of amenities including a sparkling outdoor pool, which is the ideal way to cool off during the hot Las Vegas summer. This combines with the usual amenities that you would expect, such as easily accessible WIFI throughout the property and free onsite parking. 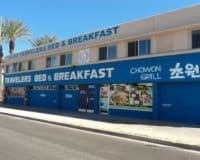 The accommodation is simple, featuring all the things you would expect to find in a hotel, without any of the thrills that often cause the price of Vegas lodgings to skyrocket. Thus, the bed is comfortable, there is a television, fridge, and coffee-maker, meaning that you can feel at home. While you can also choose to upgrade your room to ones with a seating area and sofa. Oasis at Gold Spike, is a well-located and affordable Las Vegas hotel, offering simple comforts in the medium-price range. This makes it the ideal choice for anyone who wants a comfortable room, which isn’t too expensive. Within 3 mi (5 km) of Las Vegas Convention Center and Las Vegas Premium Outlets. Within 5 minutes of Fremont Street Flightlinez and Fremont Street Experience.